Please Join us on a hike exploring the Patterson Mill site just upstream from where Erwin Road crosses New Hope Creek. We will also examine old roadbeds in the area and the new Hollow Rock Nature Park which opened last Summer. The hike will be led by Stewart Dunaway who has written The History of Patterson Mill as well as other books on the history and geography of this area. We will meet in the parking area of Hollow Rock Nature Park which is off of Erwin Road near the New Hope Creek bridge at 10 am on Saturday, Feb. 18. Please consider carpooling with others since the lot has limited spots. What a beautiful day! Thanks to everyone who came out for the hike. Stewart Dunaway’s book, Johnston and Robson Mill History – Orange County, NC and his numerous other works are available online from various retailers including Lulu.com, and locally from Flyleaf Books, Bull’s Head Bookshop, The Regulator, and many others. 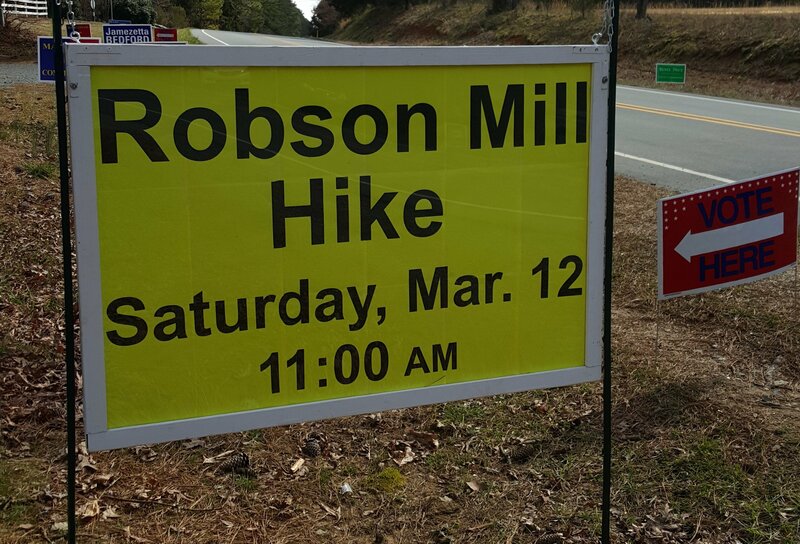 Join us Saturday, March 12th for a hike to the Robson Mill site on New Hope Creek in Duke Forest. We will be led by Stewart Dunaway, author of Johnston and Robson Mill History – Orange County, NC. Hope to see you at the Community Center at 11 am! Our many thanks to Dr. Bob Peet, who shared his time and expertise with our group of interested hikers in Duke Forest on Saturday, April 25th. Thanks too to Del Williams, who provided the following look at what the participants got to see. 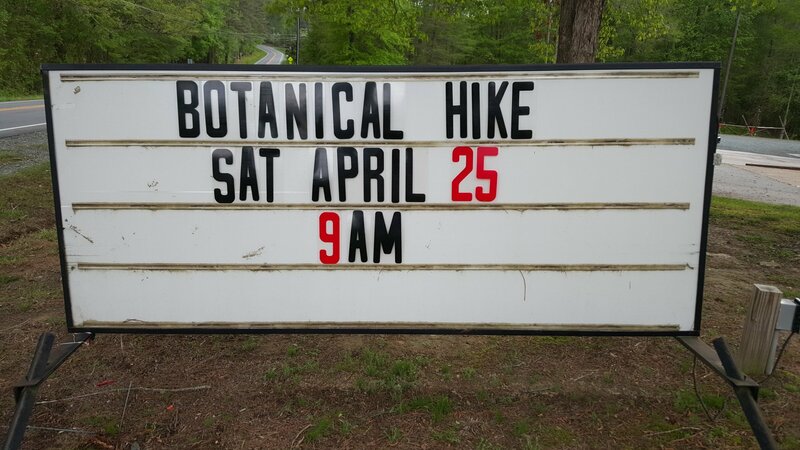 UNC botany professor Bob Peet will lead the excursion as we take a few motor vehicles into the forest and hike to some off-the-beaten-path landscapes on Saturday, April 25 from 9am until 12pm. Hope you’ll join us! The first event of the 2014 NHIA schedule was a hike to the remains of the 18th century Robson Mill on New Hope Creek, which was constructed at about the same time as the University of North Carolina at Chapel Hill (1790s). There were 12 hikers including leader Stewart Dunaway who has researched and written a book on the Robson Mill. The group also included a descendent of the Robson family who still lives in this area and had heard about the hike! We explored the ruins of the millhouse just upstream from Wooden Bridge on New Hope Creek and the dam and millpond which are further upstream. We then moved to an area on the hill above the mill where there are foundations of farm buildings and perhaps a house as well as the Robson graveyard with several intact headstones. Stewart related historical facts and speculations about the layout and daily functions of the mill/farm complex. We had a great time and Feb. 22 was one of only a few warm sunny days all winter long! There are several other interesting routes and sites along our part of New Hope Creek and more hikes will be planned. Thanks, Stewart! And thanks to all the participants.